Mercian Archaeological Services CIC' s David Budge has been using his expertise to train volunteers in Medieval pottery and pottery analysis techniques based around a University of Nottingham Museum archive from excavations in Skegby in the 1960's. The project has ran for 3 days so far - with a fantastic turnout amounting to over 42 volunteer days or 8.5 weeks of outreach so far- with days still to go! Illustrating important rims / bases / profiles. Training sessions on ceramic fabrics and medieval pottery identification . Training in the standards and guidance of the Medieval Pottery Research Group. There will be other opportunities for more learning and training soon! Mercian Archaeological Services CIC held their first Spring Conference on the 5th April 2014 at the University of Nottingham Archaeology Museum. 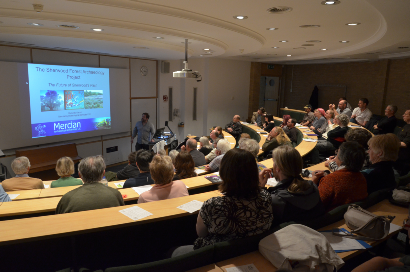 This one day conference featured some of the best work undertaken by local Community Archaeology companies, groups and individuals from around the region. Community Archaeology has come of age in recent times and heritage groups and volunteers are now setting incredible standards in archaeological research. Community Archaeology is now a fully fledged branch of archaeology and there are also now a whole range of dedicated professionals who are full time Community Archaeology Providers. There has been a sea-change in provision of services to Community groups in recent years with a move away from large commercial companies providing work on the side, and when funding was available - to full-time community archaeology providers and companies like Mercian Archaeological Services CIC who are dedicated to providing support to volunteers and groups. Mercian’s first “East Midlands Community Archaeology Conference” reflected this change, with volunteers, groups and professional community archaeologists presenting their results and theories in a lively and informal way. Many of the old barriers felt broken down as people talked, networked and enthused with other like-minded people. It was a great day for idea sharing and project discussions, and much was learned through the course of the day about the excellent work being undertaken across the region. There was also lively debate and networking during the refreshment breaks and in the museum. Mercian Archaeological Services CIC held our first Spring Conference on the 5th April 2014 at the University of Nottingham Archaeology Museum. Andy Gaunt of Mercian Archaeological Services CIC- the Sherwood Forest Archaeology Project, Nottinghamshire.